Preliminary aircraft design studies use structural weight models that are calibrated with data from existing aircraft. Computing weights with these models is a fast procedure that provides reliable weight estimates when the candidate designs lie within the domain of the data used for calibration. However, this limitation is too restrictive when we wish to assess the relative benefits of new structural technologies and new aircraft configurations early in the design process. 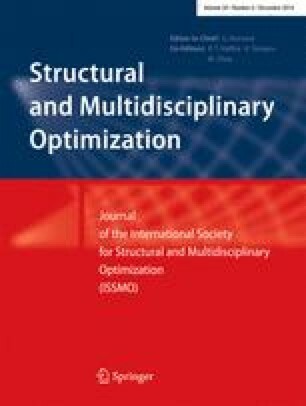 To address this limitation, we present a computationally efficient aerostructural design framework for initial aircraft design studies that uses a full finite-element model of key structural components to better assess the potential benefits of new technologies. We use a three-dimensional panel method to predict the aerodynamic forces and couple the lifting surface deflections to compute the deformed aerodynamic flying shape. To be used early in the design cycle, the aerostructural computations must be fast, robust, and allow for significant design flexibility. To address these requirements, we develop a geometry parametrization technique that enables large geometric modifications, we implement a parallel Newton–Krylov approach that is robust and computationally efficient to solve the aeroelastic system, and we develop an adjoint-based derivative evaluation method to compute the derivatives of functions of interest for design optimization. To demonstrate the capabilities of the framework, we present a design optimization of a large transport aircraft wing that includes a detailed structural design parametrization. The results demonstrate that the proposed framework can be used to make detailed structural design decisions to meet overall aircraft mission requirements. This work was partially funded by NASA under grant number NNX11AI19A. The authors would like to acknowledge Gaetan Kenway for his assistance with the verification cases presented in this paper.